For shower and tub surround applications, tile up to the ceiling if possible. If not, install tile one or two rows higher than showerhead. To begin, find the area center point of your shower floor – typically the drain. Using a chalk line tool, snap two perpendicular lines through the center, dividing your shower floor into quarters. Check the intersection’s angles using a framing square. Start planning your layout on the back wall. Find its area center point and draw two perpendicular lines through it. Check the intersection of these angles using a framing square. 2. Create a "story pole"
Next, you will create a story pole for your shower’s vertical layout. A story pole is a simply a ruler for tile – ideally the height of your shower. Lay tile against an unmarked board, leaving room for grout lines. Draw a pencil line at the beginning and end of each tile. Remember, this board is for the vertical layout of your tile, so orient the tile appropriately. If your tile is square, you can use the same story pole for the horizontal layout of the tile. If not, however, you’ll need to create a separate story pole. Lay the tile as it will be oriented from left-to-right across your shower along an unmarked board, and repeat the process. Using your story poles, see how many tile are needed, adjusting to find the best layout. Remember to leave room for movement joints at wall intersections, fiberglass or acrylic shower base, and fixtures, and around the tub. If you’re tiling a tub surround, find the lowest point of the tub line. Draw a horizontal line ¼ inch plus the height of one tile up from the tub line. This line will serve as your horizontal guideline. You can then use the measurements on your vertical storyboard and your chalk line tool to draw more horizontal guidelines, parallel to the first, that span the entire height of your shower. 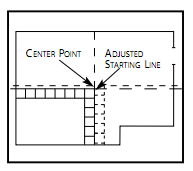 When the layout process is complete, each wall should have one vertical centerline line and a series of horizontal lines to guide tile placement. Shower tile installations may require cutting tile for the edge of the walls and around plumbing fixtures. You will want to position and cut tile as you go – rather than in advance. To cut the tile, you may need a tile cutter and/or a wet saw. You may be able to rent a wet saw tile cutter at your local Lowe's. 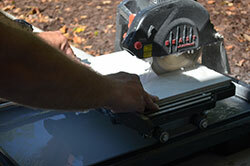 A "tile sandwhich" is tile that is correctly cut and positioned, and ready for mortar. Each tile you cut to fit your floor, should be measured and cut individually. Now that you have laid and cut your tiles, the next step is to begin applying shower mortar. 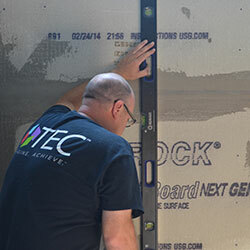 Read on to the next step of our “How to Install Shower Tile Guide” to learn how to do this. :o WoW! Such a great post about lay tile shower. Actually,I was searching for something like this kind of website. People can know everything from this article as well as this site too. Thanks for sharing. Glad you found it helpful Robert! Cutting of penny tiles for corners and terminations can be done with tile nippers or a wet saw. Unfortunately this can be a tedious process due to the small size of the individual tiles. Extra care should be taken, especially when using a wet saw.